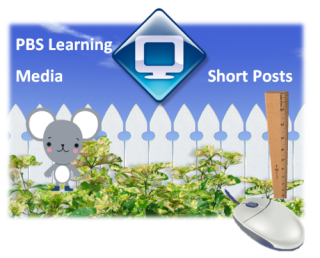 I want to make you aware of a wonderful free professional development opportunity from PBS Learning Media. This is one you just might want to apply for! Are you a digital superstar at your school?Then you may wish to take a moment to apply to the 2014 PBS LearningMedia Digital Innovators Program. This year-long professional development program is designed to foster and grow a community of 100 digitally-savvy educators through access to virtual trainings and exclusive resources, national recognition and membership into a robust professional learning community. All Digital Innovators are required to complete a set of responsibilties. All 100 selected PBS LearningMedia Digital Innovators will receive one year of professional development. See Program Benefits for a complete snapshot. You might also be 1 of the 15 top applicants who will also receive an all-expense paid trip to Washington, D.C. to participate in the 2014 PBS LearningMedia Digital Summit. How to apply? Simply complete the online application. You will need to create a short video and answer two essay questions. Learn more about the application process. Application process closes Feb 14, 2014. This is an opportunity you may wish to consider and learn with other Digital Innovators.